I hate Halloween. There, I said it. I don’t mind the macabre décor, the trick-or-treating, or the childhood joy of dressing up in a (hopefully home-rendered) costume. I hate that adults have assumed the same role as the children, disguising themselves as something they aren’t. The recent unearthing of my childhood reveals a to-the-book case of emotional abuse, but whose pain is doubled as the family scapegoat. I was a sweet, innocent-minded girl who bore the brunt of blame for my family’s dysfunctions. My older sister was the Golden Child who was allowed to physically, emotionally, and verbally abuse me. My little sister was the funny girl. Nothing was ever their fault. It was always mine. Who caused my father to drink heavily because he couldn’t deal with his emotions? Who had needs that inconvenienced the family? Who had dreams and interests that were left unexplored? Whose feelings were dismissed as a phase, or overreacting, or selfish because Mom couldn’t cope with the dysfunction? I was denied to feel angry. I was denied to feel sad. I was denied self-discovery, lest my self-esteem be boosted to a dangerous level. I was denied to blame the real issues. My family’s pain became my pain. My family wore the disguise of happy people living in peace, and a small seed of a child grew to believe that this was happiness. “You do for family,” my father said. The saying was engrained into my psyche through the deliberate affliction of pain that I bore in order to be loved. And I did do for family because I wanted them to love me. I loved them. We ate popcorn together. We laughed at stupid jokes together. We loved our dogs together. We ate dinner every night together. We were a peaceful, happy family. In disguise. The signs of emotional abuse are so subtle, so habitual, it can take a person many years into adulthood before they fit the pieces together. At 43, I’m on the young side. Family events and gatherings provide ample opportunity for the cycle to propel itself onto the scapegoat. Witnesses see it, but they aren’t sure what is happening. They might have a reaction such as, “Your sister was really lame to you, and your Mom didn’t do anything about it,” to which the victim replies, “I know.” It isn’t an isolated event, but the repetition and enabling of put-downs, condescension, belittling, guilt-trips, envy-making, general lack of respect for time and space, and denial of intention that fills the target with seeds of emotion. 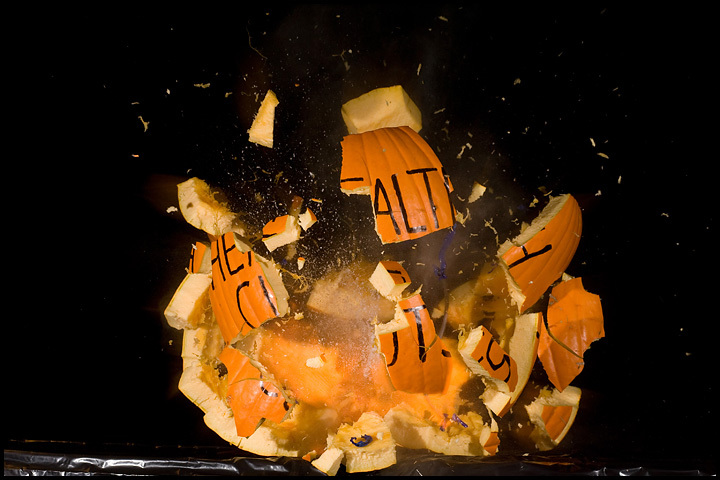 And when she finally reaches a point of explosion, it is a pumpkin eruption with seeds, stringy ooze, and meaty pieces flying every direction. She simply has no other way to let it out. This is emotional abuse. It is psychologically destructive. It is heart-sickening. It is intent to hurt the one who entrusted her goodness to the people who are supposed to love her more than anything else in the world. It’s a disguise to weaken the one who is strong. It’s a costume for the world to see. Is it any wonder I hate Halloween? Are you the family scapegoat? Visit here. Why do families target one person? Visit here.